A 1 ounce cube of cheese to a 20lb dog is the equivalent of a person eating 2 ½ hamburgers or 1 ½ chocolate bars! The most common disease in pets is not cancer or diabetes, it is obesity. I recently went out of town for a few weeks, leaving my dog with my parents. Upon our return, my mother whispered to me, “Your father gave Pepper a few extra treats here and there. He told me it is a grandparent’s prerogative”. We love our animals through food, it’s a large part of how we bond with our pets and my dog will shower you with affection when you feed her! Now, I should tell you that my dog’s previous owners, as well as my husband and I, have worked diligently to reduce her weight. She was a chunky girl (4lbs overweight at her heaviest), and we had gotten her down to a perfect weight over about a one year battle. At the end of our vacation, the scale measured Pepper at gaining two pounds (half of the weight she had lost! ), and her treat bags were almost empty (instead of being half full!). The first step is realizing when your dog or cat is overweight. An animal with an ideal Body Condition Score (BCS) should have an hourglass figure when observed from above, and a slight tuck upward in the waist towards the hips. With your fingers, your pet’s ribs should be readily felt under the fingertips. When pressure is needed to feel the ribs, this means the layer of fat between the skin and ribs is too thick, and your pet is overweight. The Hills website had a great section with questions and diagrams to help you determine your pet’s Body Condition Score. When a pet gains weight, it does not just accumulate in one location, it is evenly distributed around the body. That means increased amounts of fat surrounding the major organs such as the heart, kidneys, bladder, etc. The excess weight, can also put pressure on these organs and cause issues with breathing, or their organ function such as joint mobility. Overweight to obese animals are more likely to develop diseases such as diabetes, arthritis, heart and respiratory disease, and have reduced lifespans compared to a dog at an appropriate weight. Extra weight means less energy, and they tend to have a decreased quality of life compared to another pet at a good weight. Give us a call to recommend an appropriate weight loss diet for your pet based on their medical history. Our technicians will calculate the amount of calories for your pet’s daily needs, allowing for weight loss. 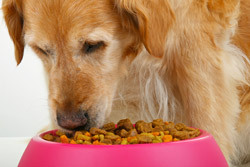 Then, we can take into account the food and treats to find a feeding plan appropriate for your pet. There is not one weight loss diet or plan which works for every pet. Also, multiple small meals are better than one large meal of the day for weight loss. This ensures your pet won’t be extremely hungry at one point, prompting their body to store more fat to compensate for these periods of hunger. Just as important with people, exercise combined with a healthy diet is the best way to ensure weight loss, and continuing to maintain weight after weight loss. There are lots of activities you can do with your pet to increase their daily exercise. For example, take longer walks more often. If your pet likes to swim, increase the amount of times they are in the pool. Take up agility training with your pet or fly ball, etc. There is no rule book which says we need to feed our pet in a food bowl. So why do we do it? Mainly because of its ease! But our pets burn no calories with the food bowl method. Instead, put their daily calories into a Kong, Busy Buddy or a Puzzle ball to stimulate their mind while burning calories. All of my dog’s food goes in a Kong toy, she has a great time being rewarded for batting the toy around! There are many other items on the market which can slow down the feeding process, such as games, or stationary objects with holes in the side for cats to use their paws to remove the kibble. Treats, whether they be people food, or dog treats, all add up to excess calories. Remember, if your pet gets a treat, you must decrease their caloric intake of their regular meal that day to compensate. Please, avoid feeding your pet people food, not only is it high in calories, it can cause major health issues such as pancreatitis, vomiting or diarrhea. For a 20lb dog, eating just 1 hot dog is the same as a person consuming 3 entire hamburgers or 2 whole chocolate bars. Our dogs and cats deserve the best, and being a healthy weight is our gift to them for a long, healthy life. Hills/AVMA Alliance for Healthier Pets. Obesity Awareness and Prevention Program.